Description: "Would you have married me if you had known?" Mical's question stays with Davey. He doesn't have an answer. Mical was wrong to deceive him, and her apologetic efforts may not be enough to keep them together. Will her spiteful father allow them the chance to find out? This sequel to Shrouded Jewels continues to follow Mical and Davey as they struggle with deception, temptation, and a sometimes bitter reality. Will Davey and Mical find their happily ever after? I have to be honest about the books I read. Most of them, even if they deal with “hard issues”, are easily within my comfort zone. Jansina’s books are not. She is brave enough to delve into some hard subjects that most books avoid. This book was no different. You will have to read the previous book, Clouded Jewels, to understand the sequel and this review is a bit of a spoiler if you haven’t read the first book. Just a fair warning, before you continue reading. Davey and Mical are trying to cope with a lie that brought them together; the lie that Mical believed in God. Yes, it is a messy situation. No, there aren’t any easy solutions. However, I loved this story because the author dealt with this situation in a good light. She didn’t glorify it or make it all better with her magic wand (er, pen). Instead this story felt very real, sometimes sadly so, yet with hope. My only disappointment in the book was that Davey wasn’t talking to God (or Papa, as he calls him) as much in this book. However, perhaps that added to the story and showed how deep the struggle was. One of the other things I like about Jansina is that her messages come naturally out of the story, they are not contrived. The story itself kept me on the edge of my seat. Mical’s father plots to end the happiness that she and Davey share. I held my breath and kept turning pages until I reached the end. 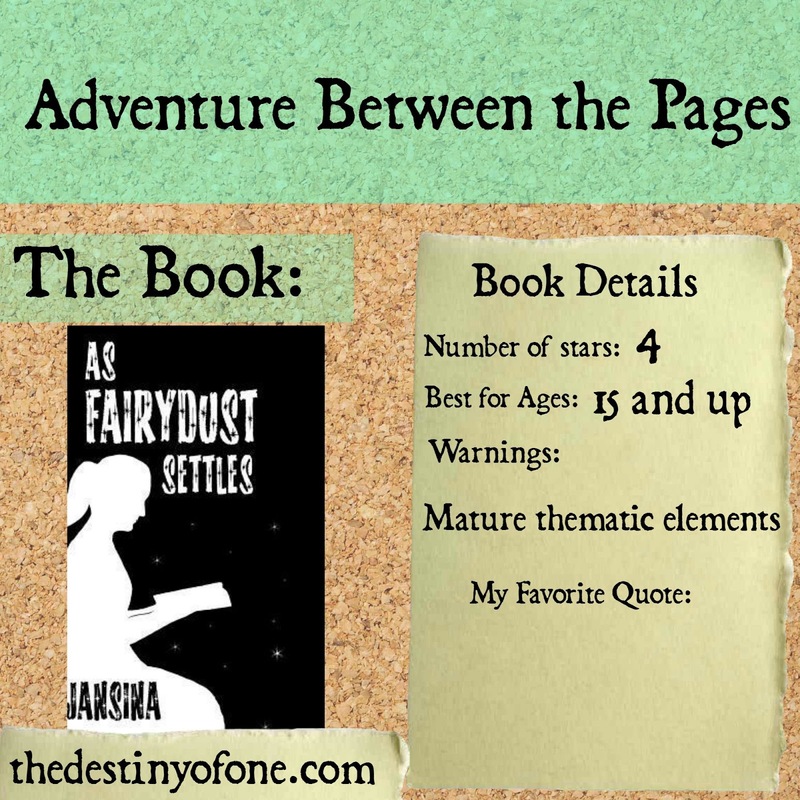 If you are looking for a challenging read that is well written, a book that isn’t afraid of messy issues or a story with a deeper message, As Fairydust Settles is a great choice.